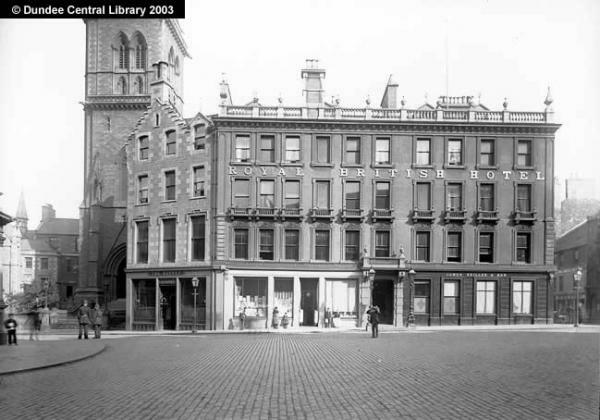 Joseph Rickard, originally from Brechin, was the owner of the British Hotel, Castle Street, Dundee from 1852. He was considered a congenial and well respected member of the community and took a keen interest in local politics. Subscriber 11 – George Lloyd Alison – a named trustee and executor for Joseph Rickard’s estate. Subscriber 145 – Messrs John Moir & Son – William Moir, a named trustee and executor for Joseph Rickard’s estate. Joseph Rickard was the illegitimate son of Ann Taylor and reputed father, Captain Joseph Rickard of the Honourable East India Company Service. His exact date of birth is unknown although is estimated to have been approximately 1822/23. The census records of 1851 and 1861 recorded Joseph Rickard’s place of birth to have been Edinburgh. However, there is evidence to support the fact that Joseph Rickard was a native of Brechin. The census of 1841 indicated that Rickard, working in an hotel in Brechin, was born in the county and an obituary in the Brechin Advertiser also stated as much. Further to that, Joseph Rickard’s reputed father and his parents are recorded as being interred in the kirkyard of Brechin Cathedral. Joseph Rickard was twice married. He first married Margaert Lumsden in 1845. On his first record of marriage he was recorded as having been a waiter in the Granton Hotel in Crammond. 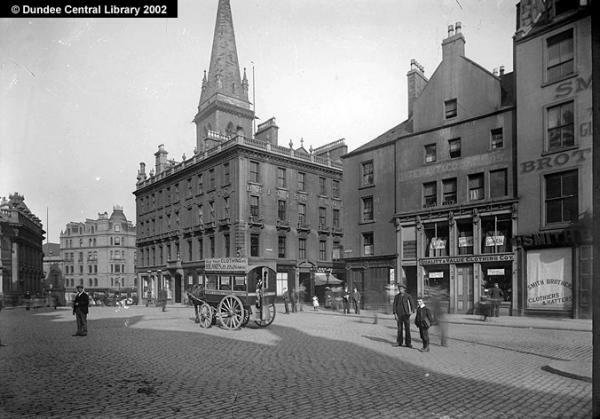 Margaret Lumsden died, suddenly, at the British Hotel in Dundee just over 7 years later, in 1853. At the end of the same year, (1853) Joseph married Christina Baillie from Brechin. He had five children all to Christina Baillie. The year before, Joseph Rickard had arrived in Dundee to continue his working life in hospitality at the British Hotel in Castle Street. Some years later, he became its proprietor, building a solid reputation within the community. In November 1863, he successfully stood as councillor for Ward I. While on the Council, Joseph Rickard sat on the Hospital Funds, (Nethergate Sub-committee) the Church Committee, the Lighting Committee, the Police and the Sanitary Committees. After his death in 1874, his son, Joseph, took over the hotel, enlarged itand added ‘Royal’ to its name. He remained there until his death in 1910. Mrs Christina Rickard outlived her husband, staying on in the hotel with her family. Statutory Registers. Dundee. Deaths. (1874). 282/3 274. ScotlandsPeople website. Obituary. Brechin Advertiser. 19 May 1874. p.4. Accessed via The British Newspaper Archive website. Old Parish Registers. St Cuthberts. Edinburgh. (1845). Marriages. 685/2 460 63. ScotlandsPeople website. Dundee Courier. 23 February 1853. p.2. British Newspaper Archive website. Old Parish Registers. Brechin. Marriages. (1853). 275/80 480. ScotlandsPeople website. Montrose, Arbroath and Brechin Review. 28 May 1897. p.3. Accessed via The British Newspaper Archive website. Scotland Births and Baptisms. 1564-1950. Family Search website. Census Records. Brechin. (1841). 275/ 7/ 1. ScotlandsPeople website. Census Records. Leith North. (1851). 692/ 1 21/ 19. ScotlandsPeople website. Census Records. Dundee. (1861). 282/1 1/1. ScotlandsPeople website. Western Cemetery, Burial Lair Records. Register Volume 1. Register Number 176. Compartment 7. Friends of Dundee City Archives website. Obituary. Dundee Courier. 12 May 1874. p.2. Accessed via The British Newspaper Archive website. Dundee, Perth and Cupar Advertiser. 03 November 1863. p.5. Accessed via The British Newspaper Archive website. Legal Records. Wills and Testaments. Dundee Sheriff Court. (1874). SC45/ 31/ 25. ScotlandsPeople website. Valuation Rolls. Dundee. (1865). VR009800015-/61. ScotlandsPeople website. Dundee Directory, 1861-62. p.196. Dundee Central Library, Local Studies. Dundee, Perth and Cupar Advertiser. 19 November 1852. p.1. Accessed via The British Newspaper Archive website. Dundee, Perth and Cupar Advertiser. 21 November 1852. p2. Accessed via The British Newspaper Archive website. Mitchell, Alison. (ed). Monumental Inscriptions. (1979). Volume 1. Strathmore. p.25. Scottish Genealogical Society. The Dundee Courier & Argus (Dundee, Scotland). 08 August 1878. Issue 7815. British Library Newspapers, Part II: 1800-1900. The Dundee Courier & Argus and Northern Warder (Dundee, Scotland). Tuesday, October 04 1881. Issue 8803. British Library Newspapers, Part II: 1800-1900. Obituary, Dundee Advertiser. 25 May 1897. p.6. Accessed via The British Newspaper Archive website. The information above about Joseph Rickard has been collated from a range of digital and hard copy sources. To the best of our knowledge it is correct but if you are relying on any information from our website for the purpose of your own research we would advise you to follow up the sources to your own satisfaction. If you are aware of an inaccuracy in our text please do not hesitate to notify us through our Contact page.